Sheldonbrown.com makes a point of providing information which is hard to find elsewhere and which will help keep older bicycles working like new — or better. Shimano Parallel-Push V-brakes have a very nice feature in that the brake shoes approach the rim squarely rather than rotating, with the risk of damaging the tire or diving under the rim. 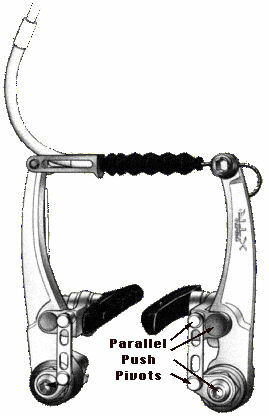 Reader Paul Rintoule has kindly sent in information on how to refurbish Shimano parallel-push direct-pull brakes to stop them from squealing, even though Shimano parts kits are getting very hard to find. This information has now been added to our page about direct-pull brakes. This entry was posted in Updates and tagged bicycle, brake, cable, cantilever, direct pull, lever, noodle, parallel push, QR, quick release, removal, replacement, shelbroco, Sheldon, Sheldon Brown, sheldonbrown, sheldonbrown.com, V brake. Bookmark the permalink.